Jitendra Foot Surgeon | Lesser Toe Deformities (Problems with small toes) What are the small toes for? The small toes are important in walking, especially when pushing off with the foot towards the next step. They share the pressure with the big toe and the ball of the foot. Lesser Toe Deformities (Problems with small toes) What are the small toes for? The small toes are important in walking, especially when pushing off with the foot towards the next step. They share the pressure with the big toe and the ball of the foot. What are the small toes for? The small toes are important in walking, especially when pushing off with the foot towards the next step. They share the pressure with the big toe and the ball of the foot. Why do they become deformed? Toes become deformed when the pressures on the toe are stronger than their joints can resist. This may because the joints are weak or the pressures strong, or both. The joints may be weak because they have been damaged by injury or arthritis. The muscles that control them may become unbalanced, so that one set pulls harder than others and causes the toe to bend. In some people the tissues in the lower part of the joint at the base of the toe become weak, allowing the base of the toe to drift upwards and unbalancing it. The main pressures that cause toes to become deformed, come from shoes which press on the tip of the toe, either because the shoe is tight or because it has a high heel, which tends to force the toes into the tip of the shoe. Sometimes, these toe deformities occur because of a bunion (hallux valgus) that pushes against the 2nd toe and starts to cause the other toes to become deformed. What problems do deformed toes cause? The main problem with deformed toes is that they tend to rub on shoes, either on the top, at the tip, or both. This rubbing may simply be uncomfortable, or the skin may be rubbed raw. Sometimes the toe may press down and cause pain in the ball of the foot (“metatarsalgia”). Bent toes may rub on one another or on the big toe, especially if the big toe is bent towards the second toe (hallux valgus or bunion). My toes are curled and rub on my shoe. Is there anything simple I can do? The most important thing is to buy shoes that have enough room in the toe area for your toes to fit comfortably. Avoid high heels, which tend to force the toes down into the tip of the shoe. Small pads on the top or end of the toe may improve the discomfort. Can chiropody help with deformed toes? A chiropodist can give advice about shoes and insoles, and can treat the hard or raw skin that develops over some deformed toes. Chiropodists in Britain and most parts of Europe do not operate to straighten toes. If your toes are interfering with your daily activities and the problem is not helped by the simple measures outlined above, it may be best to have an operation to straighten the toes. Your GP can refer you to an orthopaedic foot and ankle surgeon who will listen to your problems, examine you and advise you on the best method for straightening your toes. 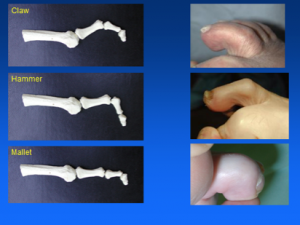 rarely, some patients (usually the very elderly or frail) prefer to have the toe removed (amputation) rather than have the toe continue to cause them problems. 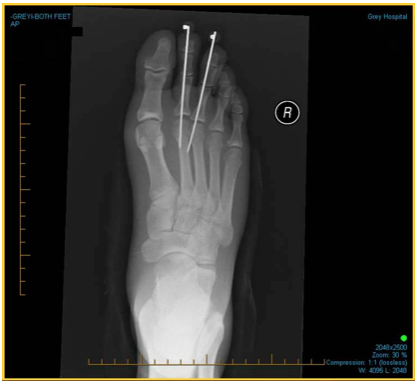 Any of these operations may be held straight with a metal pin inserted into the toe, which is later removed. Are the results of surgery good? Yes. Over 80-90% of toe operations correct the problem for which they were done. Most people are satisfied with their toe surgery and “terrible” results are rare. Toe surgery is not easy, however, and it is important to have it done by someone with proper training and experience. How long will it take for me to fully recover? Most patients after their operation take between 6 weeks to 6 months to recover fully. Driving can usually start after 6-8 weeks. If all has gone well, you will usually be discharged from clinic somewhere between 3 and 6 months or so.